Stock # 5982, 6.7L 8-Cyl Engine, Automatic, 2932 mi. Trim: Utility ~ 4x4 ~ XLT ~ Diesel ~ Only 2K Miles! This 2016 Ford F350 XLT 4x4 Diesel Beverage Utility Truck is a lease return with 2K miles. This low mile truck is ready for work! The dimensions of the box are length of 12'8" and width of 8'0". Loaded with A/C, power door locks, windows, and mirrors, cruise control, tilt steering wheel, AM/FM stereo, CD player, SYNC, 6.7L V8 PowerStroke Diesel engine, back up camera, back up alarm, trailer brakes, and tires with plenty of tread. Priced at $38,980, this truck offers great value for your money. Still under factory warranty. Don't miss your opportunity to own a low mile vehicle! Come see it today! Refer to our website for a full list of over 150 trucks. ~ www.WHYBUYNEWAUTOS.com ~ You won't beat our quality, you won't beat our price. Why buy new? Come see for yourself! 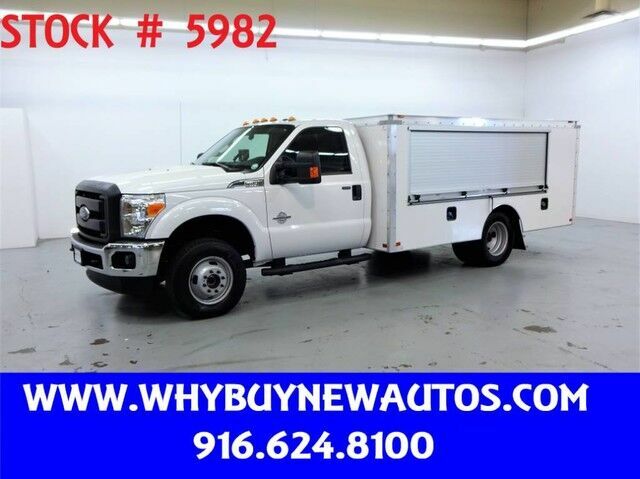 2016 Ford F550 ~ XLT ~ Crew Cab ~ Cab & Chassis ~ Only 30K Miles!